Fish are cold-blooded aquatic vertebrates usually having scales and breathing through gills. There are over 27,000 species of fish, making them the most diverse group of vertebrates. Nashville Zoo has many examples of salt-water and freshwater fish which are found in The Unseen New World. 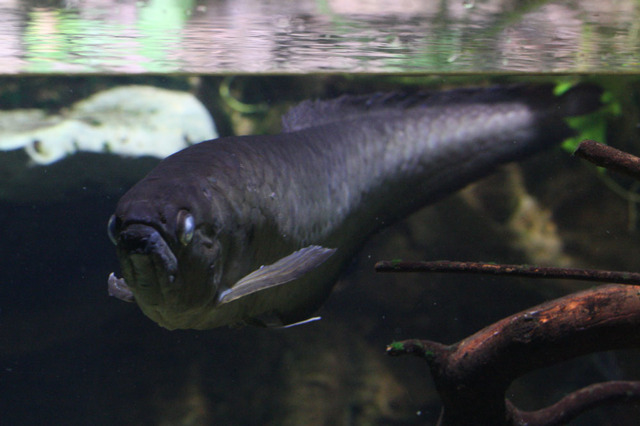 Black arowana are large fish from northern rivers of South America. They are can be referred to as “monkey fish” for their ability to jump out of the water to catch prey. They are mouthbrooders which means that after the eggs are fertilized the male will collect them in his mouth, keeping them their until they hatch. Arowana provide some juvenile care after eggs are hatched, this allows for smaller broods of fish with higher survival rates. Discus can be found in many colors, the stripes visible provide means of communication within the school and also as camouflage from predators such as other fish, birds, and turtles. Schools of discus will hide under debris to avoid predators. Male and female will chose a clean spot where the female will lay up to 400 eggs. 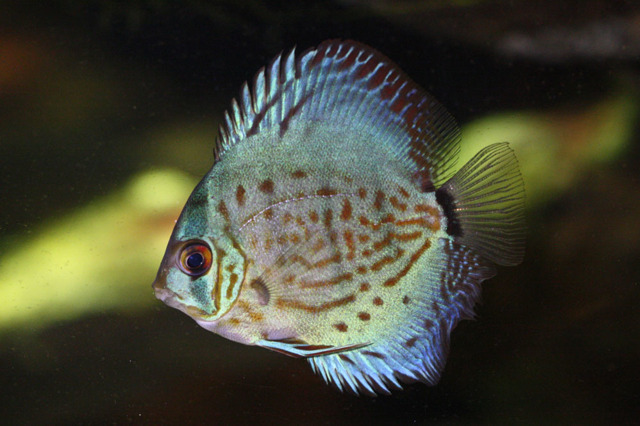 After fertilization both male and female discus will guard the fish until they hatch. The young fish then eat the mucus off the adults until they are large enough to eat larger food. 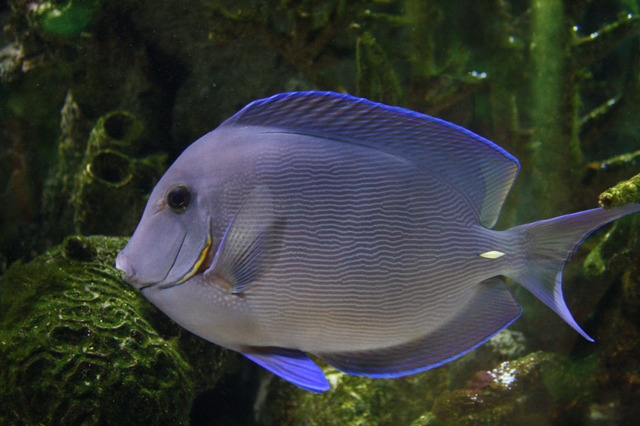 Blue tangs are one of the 80 different species of surgeon fish. They are called surgeon fish due to the sharp spines on either side of their tail. Blue tangs are most active during the day, and are usually solitary, but can occasionally be seen in schools of up to 12 fish. During reproduction, the eggs laid by the surgeon fish will hatch about 24 hours after being laid, and it will take about a year for the juvenile fish to reach maturity. Blue Tang surgeon fish are important in their ecosystems because they constantly graze on algae, which keeps it from overgrowing and covering coral. They will even form cleaning stations where they will eat algae off of sea turtles. 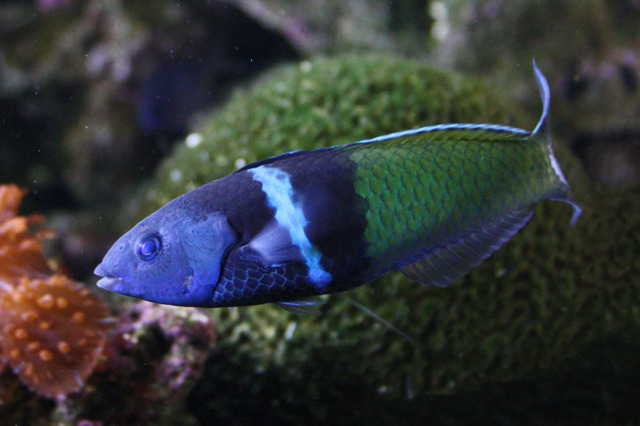 Bluehead wrasse live in large schools of mostly females with a few dominant males. If these males do not exist the largest female can change into a male which ensures that the school can successfully mate. After eggs hatch the fish do go through several color phases until they reach a terminal phase where the blue headed coloration is visible. They are social fish and can be found in schools of possibly thousands along coral reefs where they are valued by other animals as cleaners, removing parasites. Unlike other cichlids, the jaguar cichlid does not present a permanent pattern until it is fully mature. 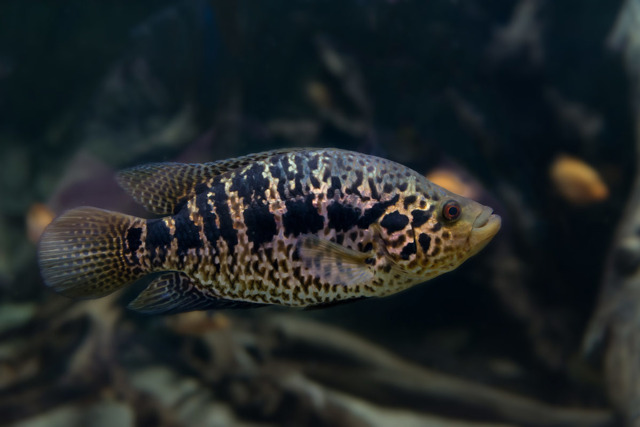 When young, jaguar cichlids are patterned with several dark bars, but as they age, males lose the bars and develop the more familiar “jaguar” pattern. Jaguar cichlids are popular in the pet trade and were introduced as an invasive species to the Atlantic Ocean near Florida. You can see our jaguar cichlids inside the main viewing building of Expedition Peru: Trek of the Andean Bear. The seahorse is one of the most unique looking fish found in the ocean. It has a prehensile tail used to hold on to sea grass and coral. Seahorses have a voracious appetite and will eat for up to 10 hours a day; consuming more than 3,000 crustaceans during that time. Seahorses are monogamous, and will usually have one mate during their lifetime. During a mating dance the female will pass eggs to the male. He will then hold the fertilized eggs in his pouch until they emerge about 20 days later as miniature versions of an adult. Juvenile seahorses will reach maturity in 8-10 months. 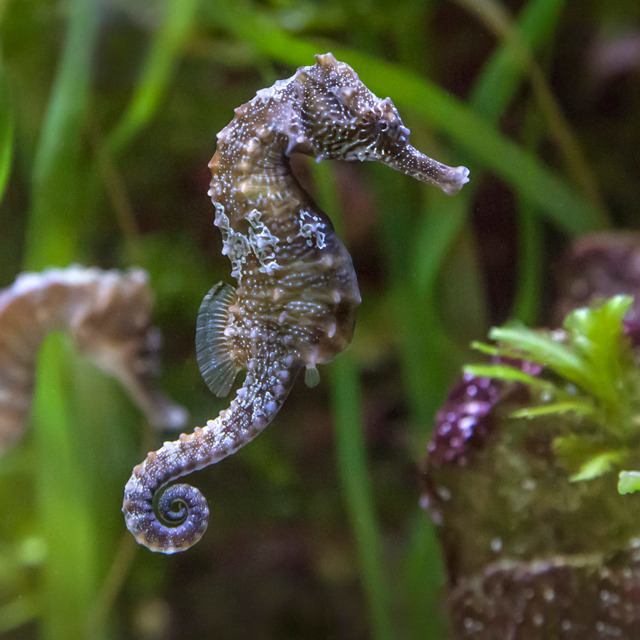 Seahorses are at risk due to overfishing and habitat degradation. We participate in the Lined Seahorse Species Survival Plan®. The venomous lionfish uses its 18 needle-like dorsal fins to defend itself. Its sting can be very painful to humans. Lionfish will live in small groups as juveniles and while mating, however they are solitary as adults. They are nocturnal and get most of their food within the first hour of the night. When the sun comes up in the morning they will retreat to their homes in reef crevices. 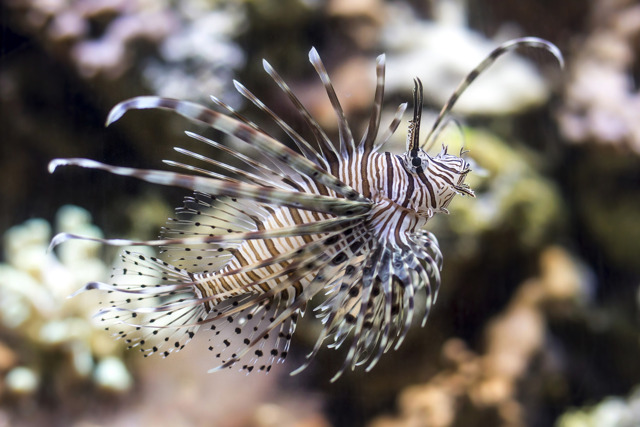 Due to their beauty lionfish are popular in the aquarium market. Lionfish were introduced into the Atlantic Ocean where they spread rapidly and are now an invasive species that are a major threat to biodiversity. 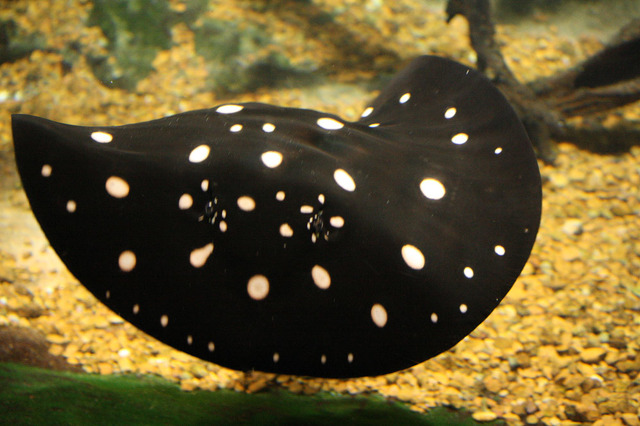 Also known as the peacock-eye stingray, the ocellate river stingray is one of the most widespread freshwater stingrays. These stingrays migrate within freshwater rivers and streams throughout South America. 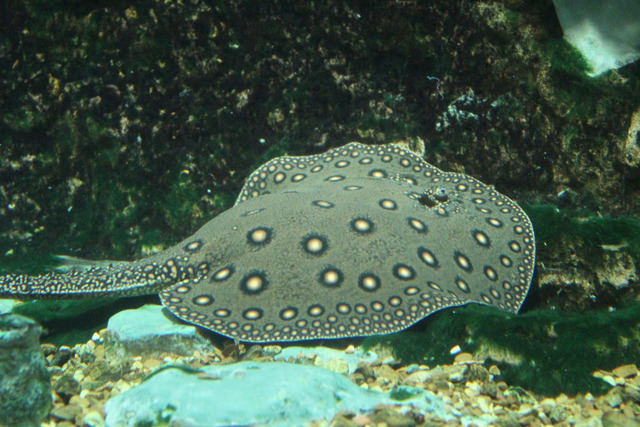 Like all stingrays, the ocellate stingray is ovoviviparous, meaning a female stingray will develop and hatch eggs inside of her, then have a live birth. To detect predators, the ocellate stingray utilizes its nearly 360° field of vision, olfactory organs and elaborate electroreceptor system that can detect low-frequency electrical stimuli that cannot be visually perceived. The serrated, venomous spine on the tip of the ray’s tail also serves as a deterrent for predators. You can see our ocellate river stingray in the Unseen New World. We participate in the Ocellate River Stingray Species Survival Plan®. 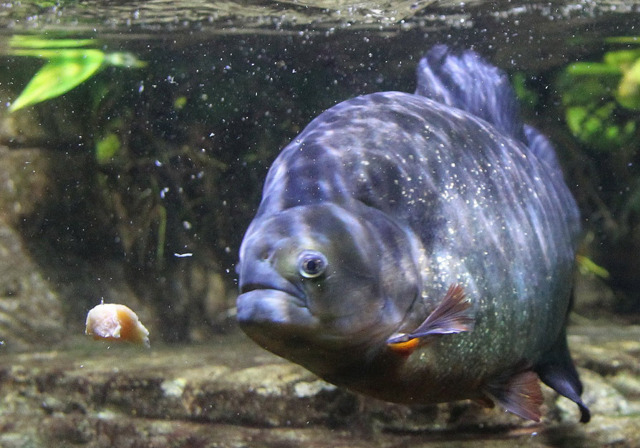 Despite being shown as a dangerous and unpredictable predator, the piranha does not hunt in large groups and usually eats fish, insects, and aquatic invertebrates. The sharp triangular teeth and powerful jaw make the piranha able to bite and attack with great force. Schools of piranhas have been known to gather at a large prey item and strip it to the bare bones within a few minutes. These are not usually random attacks and happen due to the fish being provoked or starvation. Breeding typically occurs during the rainy season and females will lay nearly 5000 eggs in nests built by the male. Redhead cichlids are one of the most popular species of aquarium cichlids. Unfortunately, some aquarium owners choose to get rid of unwanted fish by releasing them into nearby waterways. Because of this, red head cichlids have been introduced to waterways all over the world, from Singapore, to Australia, to Florida, and the impact of these introductions to the native wildlife is currently unknown. 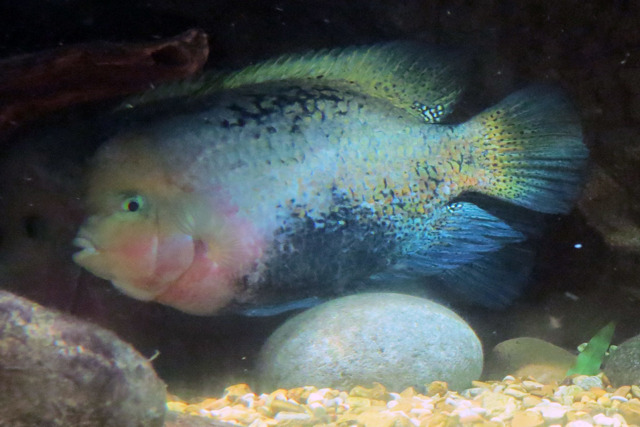 You can see our redhead cichlids inside the main viewing building of Expedition Peru: Trek of the Andean Bear. 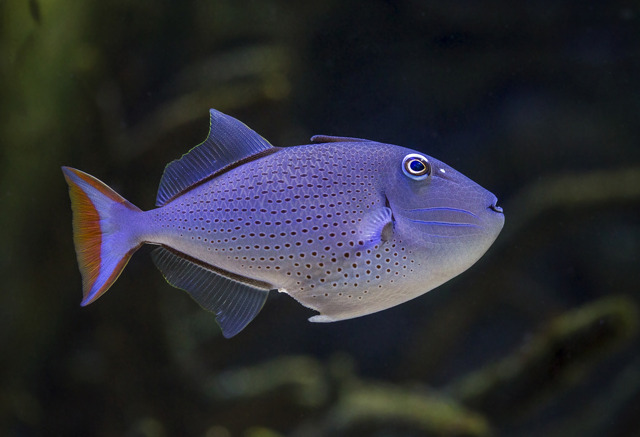 The red tail triggerfish lives alone or in small groups. They are one of almost 40 different species of trigger fish. They frequently live in patches of plants called sargassum and will move to deeper waters as they get older. In some areas of the ocean they are the most common fish. The white-blotched river stingray is only found in the Xingu River basin in South America. The distinctive blotched pattern on this species helps camouflage it in the sun-dappled streams where it lives. Since the white-blotched river stingray has a relatively small distribution range, habitat loss and degradation have left the population near threatened. Further research, management, legislation, and conservation measures are needed to protect the white-blotched river stingray. You can see our white-blotched river stingray inside the main viewing building of Expedition Peru: Trek of the Andean Bear. We participate in the White-blotched River Stingray Species Survival Plan®.